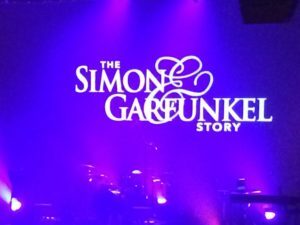 On a cold and snowy Saturday night outside Kelowna Community Theatre, folks inside the old barn were Feelin’ Groovy and having A Hazy Shade of Winter good time seeing The Simon & Garfunkel Story unfold before their eyes in music and video. 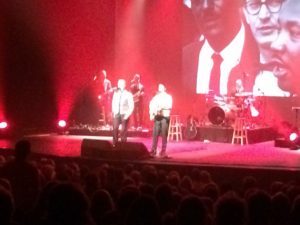 Late in the Evening, this was an outstanding musical tribute that paid homage and mad respect to singer-songwriter Paul Simon and singer Art Garfunkel. These two gents from Queens, New York first performed together in 1953 in an elementary school production of Alice in Wonderland. They went on to become folk rock legends and counterculture icons with a wealth of classic hits and 25 million albums sold. On this Kelowna evening, Taylor Bloom filled the snow boots of Simon and Ryan M. Hunt, with his tallness and curly locks, was the gangly Garfunkel. Backing them up were Evan Jay Newman on keyboards, Matt Baldoni on guitar, Randy McStine on bass, and Bob Sale on drums. This in sync six-pack has been touring across several continents and exceedingly lived up to the rave reviews posted by fans and reviewers. The first fives words sung by Bloom and Hunt were “hello darkness, my old friend” from The Sound of Silence. Talk about throwing a strike on the first pitch. There was polite applause with a gasp of familiarity in the air. It was easy to assume that this classic opener was a tasty appetizer leading into the delectable dishes of the main menu. What I particularly appreciated was the usage of a giant video screen at the back of the stage. 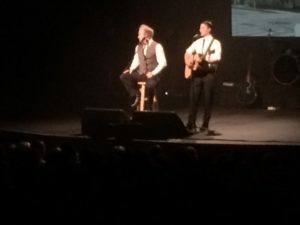 Throughout every song, the screen was filled with cartoon pictures of the main two characters as well as black-and-white photographs and clips of pop-culture newsmakers, events, and products during the time period when Simon and Garfunkel were creating magic. This blended presentation for the eyes and ears was a well-conceived construct that iced the concert cake. Later in the first set, before intermission, my favorites were I am a Rock, Homeward Bound, Scarborough Fair, and Feelin’ Groovy. All of these songs came off two of the duo’s early albums – Wednesday Morning 3 A.M and Parsley, Sage, Rosemary and Thyme. After the break, the audience was immediately drawn in with Mrs. Robinson and A Hazy Shade of Winter. 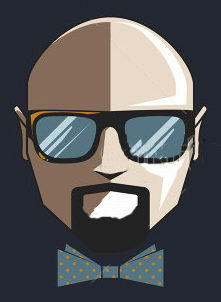 Soon after came upbeat renditions of Cecilia, Late in the Evening, and Bye Bye Love (a tribute to the Everly Brothers). The final 10 minutes were a smashing solo by Hunt of Bridge Over Troubled Water and the duo finishing up with The Boxer. By this time folks were on their feet and giving a warm and handsome sendoff to the entire cast for a job extremely well done. Big Finish – Maybe the only things missing, in my musical memory, were peppy versions of 50 Ways to Leave Your Lover and Me and Julio Down By the Schoolyard. 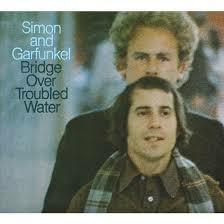 For trivia buffs, Bloom stated during the show that the Bridge Over Troubled Water album was the number #1 selling album in 1970, 1971, and 1972. Hey Jude. It beat the Beatles.